This week we are looking at Birmingham inks, exclusive to the Birmingham Pen Co. According to their site, the ink is made in Germany. Today's ink is Birmingham George Westinghouse Alternator Crimson. I purchased my sample of ink from Birmingham Pen Co. The ink is available in 5ml samples and 30ml bottles. I love that the 5ml samples are glass, and have a metal lid, but there is a little plastic stopper in the top that keeps it from leaking. When you take the stopper out, ink flies everywhere, and frankly it's just a mess. Let's take a look at the ink. Alternator Crimson is somewhere in-between a purple and a brown. The Alternator part of the name makes sense because it's a dark color, but the Crimson doesn't seem to factor into the color. In large swabs it looks like a dark purple/brown. There is a little bit of red that seeps out around the ink drops (which could be what the Crimson name refers to). Water resistance: Medium-some of the ink washed away, but you would probably still be able to read what was said. Feathering: Low-there was some feathering on Rhodia, mainly in the flex nib, but in some of the other nib sizes as well. Other properties: Very low shading, no sheen, and no shimmer. There is just a tiny bit of shading, not much. On 20 pound copy paper there was some feathering. 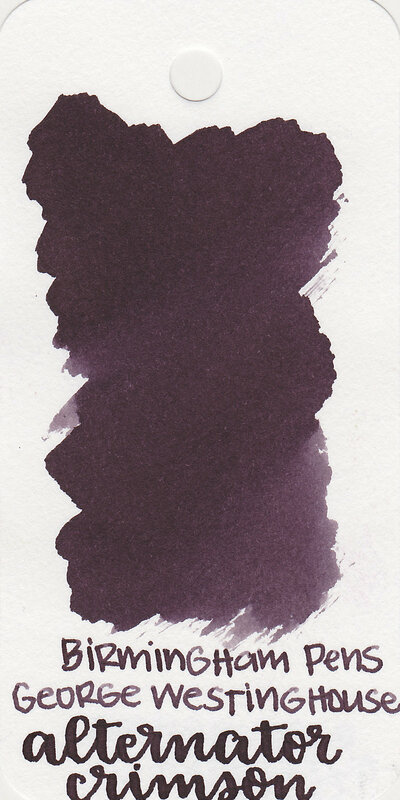 Ink swabs for comparison, left to right (top to bottom for mobile RSS): Birmingham Lilac Wind, Birmingham Alternator Crimson, and Robert Oster Charcoal. Robert Oster Black Violet, Robert Oster Dark Chocolate, and Nemosine Alpha Centauri. Click here to see the purple inks together. I used a medium Pelikan M800 Renaissance Brown on Tomoe River paper. The ink had a wetter flow. Overall, it's an interesting color, not black or brown, but not quite purple either. I'm not crazy about it due to the feathering, but give it a try, you might love it.